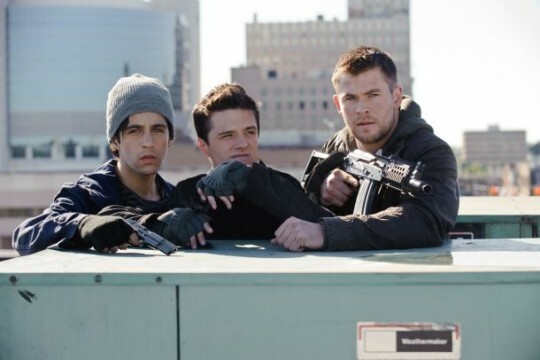 Chris Hemsworth (Thor), Josh Hutcherson (The Hunger Games), and Adrienne Palicki (G.I. Joe: Retaliation) deliver a full arsenal of pulse-pounding excitement in this explosive action-adventure! The unsuspecting citizens of Spokane, Washington, wake up one morning to the shocking sight of foreign paratroopers dropping from the sky in a surprise attack on the United States. Soon the entire region is under enemy control, but a group of courageous teenagers has decided to fight back, waging an all-out war against the invaders, to take back their town – and their freedom! 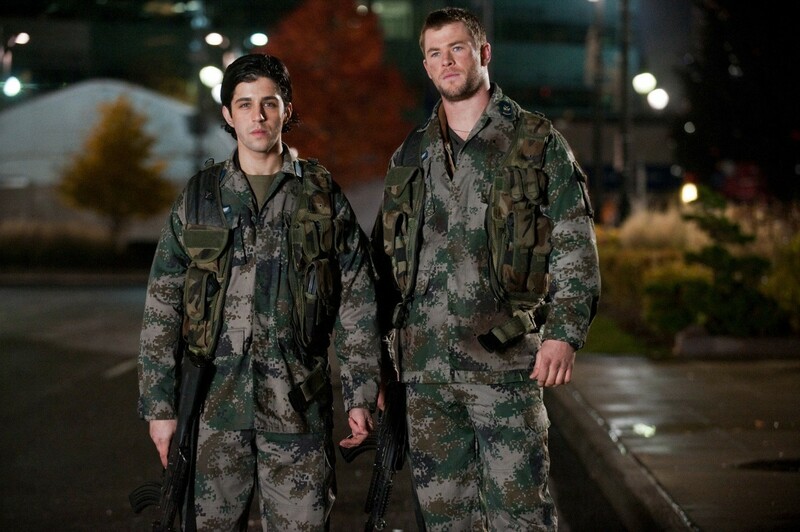 Jed (Chris Hemsworth) is a U.S. Marine on leave, who has returned to his hometown of Spokane, WA. Younger brother Matt (Josh Peck) is in the middle of a big game with his brother and father watching. He loses the game but is still complimented by his father. This is the point in the movie where I expected the film to be about the high school screw up who ends up being a hero, but the movie surprised me as it later turns out that he’s not really a screw up and has a fairly supportive family. While hanging out at a local bar, the lights go out and Jed and Matt head home. In the morning, they wake up to the house shaking. Outside they see paratroopers everywhere in the sky. The brothers jump in the truck and race through town trying to figure out what’s happening. Nearby homes explode, and it’s clear the town of Spokane, Washington is being invaded. They run into the enemy military leader Captain Cho (Will Yun Lee) and head out of town. Captain Cho quickly realizes who these trouble makers are and they include the mayor’s son. The mayor asks the boys to surrender and cooperate. When it’s his turn to talk, Jed and Matt’s father tells the boys to run. The town of Spokane quickly becomes a police state and it’s clear that the group of rebels need to be trained. Jed is well trained and passes on his knowledge and skills to all who escaped. The group kills soldiers one by one and often plants explosive devices in town, hoping specifically to take out Captain Cho. They begin tagging walls, and making their presence known, and are given the nickname “The Wolverines.” Along with a small unit of men that stumble upon the gang, the goal is to create anarchy, and stop the invading forces before they take over the country. 1984’s version of Red Dawn starred Patrick Swayze, Jennifer Gray, C. Thomas Howell and Charlie Sheen – and I have yet to see it. When they remade the film starring Chris Hemsworth, I decided I wanted to see it. I’d recently seen Chris Hemsworth in Cabin in the Woods and Thor, and decided that I like him (mostly because he’s easy on the eyes). From friends who saw and liked the original, I heard that the remake was a big disappointment. It sounds as though this is a remake using the name and is loosely based on the same plot. Whether you call this movie a reboot or a remake, it always makes me cringe when I hear someone has re-imagined a previous film. Having never seen the first, I can’t say if this does it justice for sure, but my guess is no. The main difference in the story has to be the fact that this time the bad guys are North Koreans instead of Russians. Whether or not in this update they actually represent an relevant threat to our country, the film failed to instill any fear of the outcome or come across as believable. On the plus side, I recognized the many ways that the filmmakers tried to avoid the usual clichés. The action hero and the pretty girl don’t develop a relationship throughout all the fighting. The younger brother isn't a total screw up who finally gets the chance to show his brother his true worth. It’s a nice bonus that the film isn't 100% predictable, but the filmmakers failed to develop any personal stories that make you care who lives or dies. The boys father was the only person I rooted for after a his touching speech to his sons while at gunpoint. Of course, there had do to be at least one predictable inclusion and for this film it happened during the speech Jed delivers to inspire the group that you know will be repeated word for word later to inspire other anarchists. 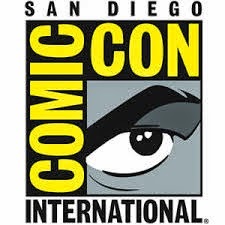 The film does have a lot of gunfire and explosions and is a loud action movie throughout a lot of it. If you don’t care much for the story and just want to see things blow up – this might be the film for you. It doesn't quite hit the mark for me as a mindless action flick and it definitely doesn't make me wonder if the North Koreans are coming to get us. To be fair, it wasn't a complete waste of time either, and that’s more than I can say for a lot of movies. Although the plot failed to impress, the Blu-ray’s video quality is exceptional. 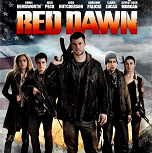 In both day and night external shots and interior lighting, Red Dawn looks good. The detail on display is impressive with sharp looking textures in both the clothing and the environment. Colors are limited but accurate and black levels are inky and solid. Red Dawn’s DTS-HD Master Audio 5.1 soundtrack is also better than average. 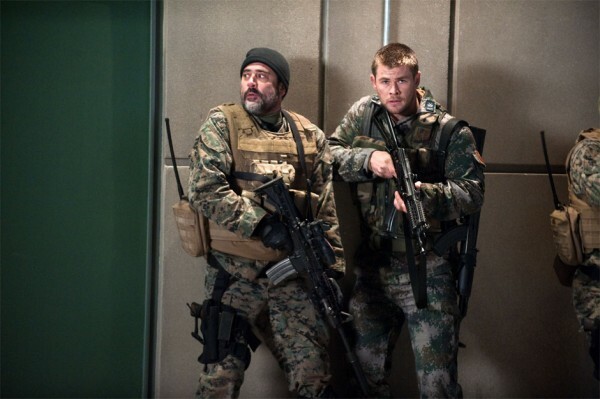 With plenty of gunfire and explosions this is a film that can rock your living room. Dialogue is consistent and clear throughout, and the crowd at the opening football game is believable as well. 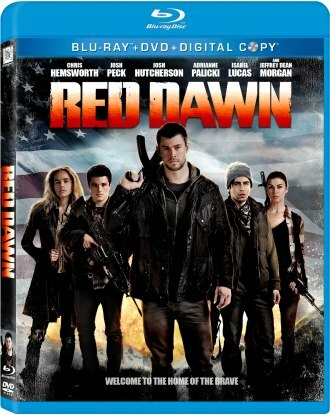 Disappointingly, Red Dawn’s Blu-ray does not contain any special features. The only thing you will get is a DVD and Digital Copy of the movie included. 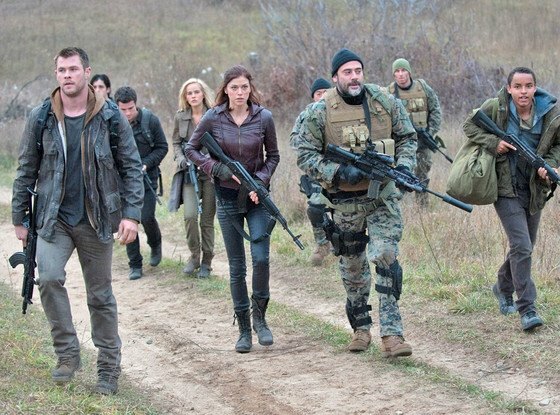 Having not seen the original Red Dawn, I am fairly comfortable saying this remake does not do it justice. On it’s own, it has a lot of action but fails to deliver much suspense. The actor that was chosen to play the little brother was a little too geeky to pull off being a high school football player and it’s not likely he’d be related to a guy that looks like Chris Hemsworth. Was Liam Hemsworth not available? I was hoping for non-stop action and there was actually too little action overall. While I thought it could have been a better movie, I did enjoy it more than my friends did.